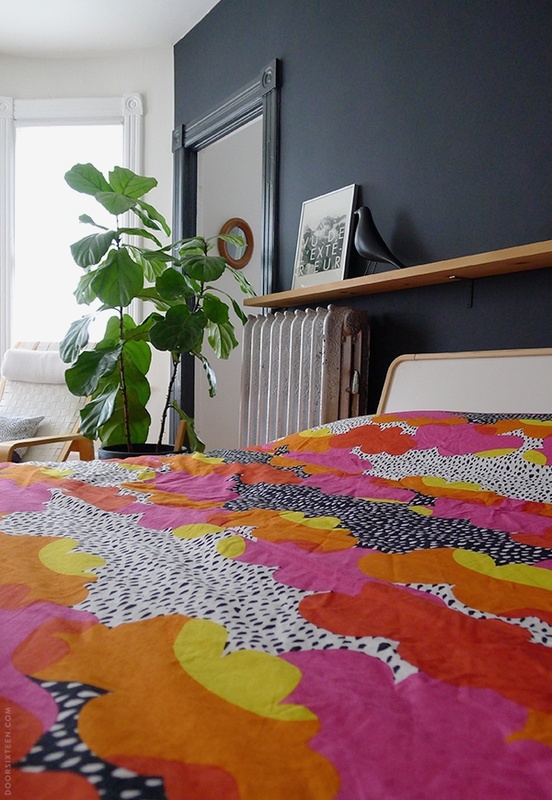 I wasn’t looking for a new duvet cover, but when I spotted the new-ish TOFSVIVA at IKEA a few weeks ago, I got heart-eyes and had to have it. The color palette is perfect, and I my affection for droplet patterns and clouds is unending. So nice! I love it against the dark wall in our bedroom. TOFSVIVA was designed for IKEA by Linda Sjunnesson, who is also responsible for the Josef Frank-ish KNAPPSÄV cushion I’ve had my eye on. OK, I don’t iron my bed linens. I don’t really iron anything unless I absolutely have to, honestly. I started cloning out the wrinkles in this photo last night, but I quit after five minutes. Apparently I’m no less enthusiastic about digital ironing than I am in the physical world. So…wrinkles. Whatever. The TOFSVIVA duvet comes in a set with two pillow shams for the alarmingly low price of $29.99. Like other IKEA bed linens it’s 100% cotton, but I must say it’s definitely on the rough side texture-wise. The thread count (144) is somewhere between burlap sack and dishtowel. That doesn’t bother me at all for the duvet cover, but the pillowcases are pretty scratchy on the face. Evan switched his to a plain white case last night. I think they’ll get softer with more washings, but I may just go ahead and turn the pillowcases into tote bags or throw pillows or something. But still, $29.99 for a really nice-looking duvet cover? I’ll take it. 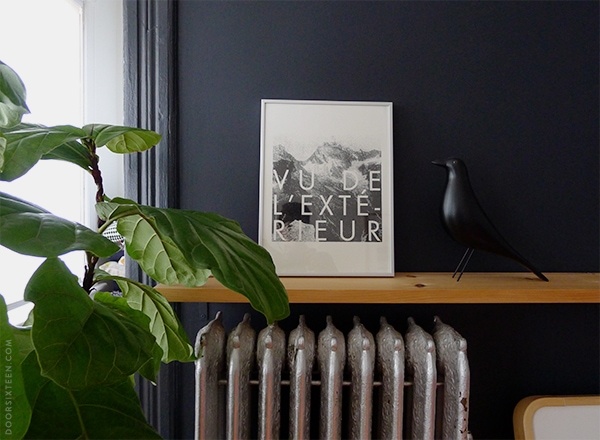 That beautiful silkscreened “vu de l’extérieur” print is from Fieldguided. 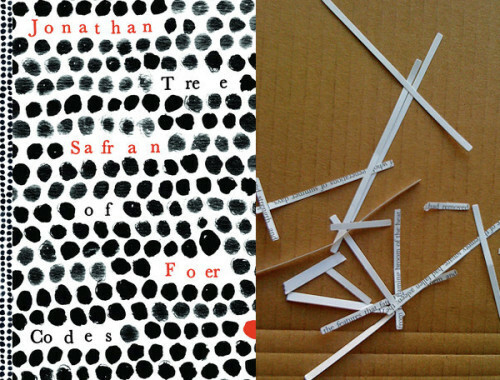 I love Anabela and Geoff’s work, and I think this piece is my favorite. So dreamy. A bit of the new office, now at the front of the house. I love your bed! Is it a fabric headboard and wood frame? It’s absolutely perfect for your space. Where did you pick it up? Hi Nicole, the bed is from IKEA’s ÅNES line, which is (of course) long-discontinued. It’s all wood, no upholstery. It’s so happy! 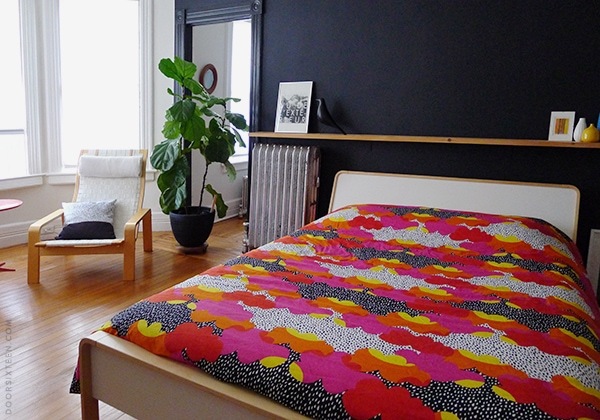 I’m the same about ironing bed linens, so I gravitate towards ones that are supposed to look kinda wrinkly (like IKEA’s Ofelia Vass set, which is in the guest bedroom). The chair is also from IKEA, many years ago. I don’t remember the name, but like the bed, it’s also discontinued. They only made it for a very short period of time! IKEA bedlinens soften with use, if you can wait it out, especially when they’re washed hot. Love the whole entire room. I concur with Anna — even though they’re cheap, if they’re 100% cotton, the IKEA bedlinens get magical with lots of use. I bought a really cheap duvet set once and now it’s one of my ultimate favorites. SO SOFT. I love the colors with your dark wall! Maybe you could buy some inexpensive pillows and just use the pillowcases as accent pillows on your bed. I was thinking about painting my spare bedroom wall in black chalk paint. 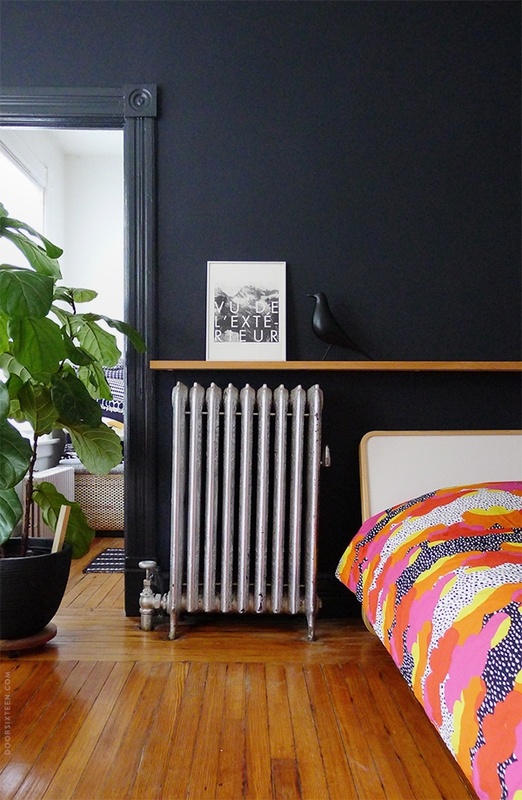 Now that I see what a great statement a black wall makes, I will not waste any more time! Love the duvet’s splash of colour. Haven’t been to IKEA for a while, as I tend to need 2 cars when I leave! Hi Lyndie, this actually isn’t chalkboard paint—it’s matte-finish Benjamin Moore in Soot (sort of an inky-blue-black). Chalkboard paint tends to be extremely flat and non-reflective. Not a bad thing if that’s what you’re going for, but keep it in mind when choosing your paint. Ikea always has such cool duvet covers. What kind of plant is that? It looks awesome! It’s a fiddle leaf fig tree. The comparison to a burlap sack made me laugh – it’s so true! Very pretty. I think the orange + yellow oddly gives it a nice fall feeling, which is appropriate timing! I love the colours against your black wall. The sunlit room definitely helps against it seeming gloomy, but that colour break and the white head board and white side wall are such a nice way of balancing it. Going to have to stalk through your archives to see whether the facing wall is also black. PS The chair is interesting — my eye first assumed it was the classic Ikea Poang, I didn’t know they’d mimicked that in other variations. I just bought this cover last week (in Australia) and agree with you about the quality – it’s not amazing. The price is very low, but personally I’d be prepared to pay more for a better product. I adore the print though! I am so excited that you have mentioned this on your blog – maybe it will be like the time you mentioned that the society6 products weren’t that great, and they listened, and improved! 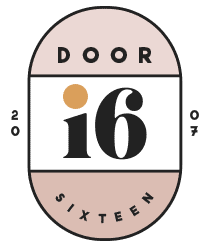 Next up; Door 16 curates IKEA ideas? I would so love that. Kelly, it was just the Society6 iPhone cases I had a problem with—not any of their other products. I really don’t think the eventual improvement had anything at all to do with my post, but it’s a nice thought, haha. Two questions, and potentially odd ones at that! 1) I’m thinking of painting the worlds smallest bathroom (7×4) black. 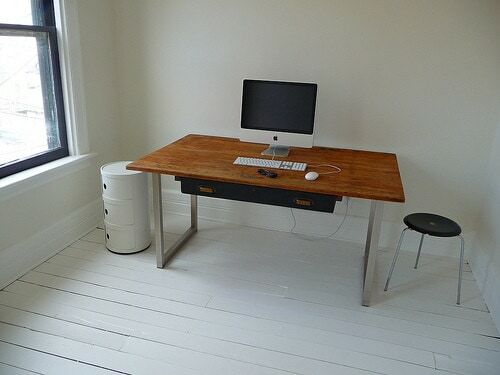 Do you ever feel like skin looks funny in this room, or with the white/natural light is it not a problem? I did a small bathroom navy once and it made me look sick in the mirror 🙂 Feel free to chime in if anyone else has thoughts! 2) Can you tell me the width of the trim in the room? I’m restoring a Victorian built in 1906 and have found a lot of varying opinions on what would feel authentic. Hi Beks, not much of this (large) room is black—just one wall. The other four walls and the ceiling are white, and the floor is wood. My tiny downstairs bathroom has a black floor, black upper wall, and black ceiling, though, and I’ve never thought my skin looks any more awful in there than it does anywhere else. I think it comes down to the right lighting more than anything. I have two filtered glass sconces at face-level surrounding an antique mirror: Pretty much the best case scenario when it comes to tricking myself into thinking I don’t look like a goblin. I’m not sure what width the trim is (I’m not at my house right now), but I’d guess the baseboard is about 10″, and the window casings are about 5-6″. I ordered 5′ rosettes for around my windows, glad to see them in a room I admire! Hi Anna! You are correct, that is a gorgeous duvet! It looks absolutely stunning against the dark wall. Oh, love this. By the way, my white duvet cover is from IKEA… it will soften up after a couple washes. We don’t sleep with the pillow cases, I bought black pillow cases at Target to sleep on. I’m with you on the love for droplet patterns… I just got this H&M seat cushion for my white shell chair. It’s perfect! It’s so you! Sometimes I feel like IKEA can do no wrong and this comforter is proof! I love how the color pops against the black wall. Thanks for sharing that print too. I know you are a huge IKEA-fan, so am I – I’m Swedish so how could I not. :-) But in recent years I’ve found myself growing tired of the “buy new stuff – throw away the old stuff”-thing that I almost stopped going there. Last time I visited mom and dad, my dad showed me an IKEA bill from 1976 of all the furniture they bought when they first moved in together. They bought almost EVERYTHING at once (Seriously, what young couple could do that now a days?) and I remember ALL of these pieces from my childhood and some of them ARE STILL THERE. This got me thinking – maybe it’s not IKEA but OUR MINDSET? My parents clearly cherished these pieces of furniture. Is there a critical point where stuff just gets too cheap so that you don’t cherish them enough to keep them for long? Hi Emma! This is probably something better suited to discussing in a blog post (which I should really do! ), but in short, I really don’t think of my stuff from IKEA any different from anything else I own. I buy for quality and design regardless of how much something costs. I have IKEA furniture and textiles that I bought almost 20 years ago. The things I haven’t kept (usually because I moved and they didn’t fit/work in the new space) were given to family members, and they’re still in use now. I’ve discarded very few things over the years, to be honest, and as is probably apparent from my blog, I don’t really replace things often. I like to keep stuff forever. 🙂 It’s nice to have two duvet covers now, though! One is plain white, and this is the other. Who the hell has time to iron their bed linens though? I love the contrast in colours and patterns in this, such a cool design! Ow – heart eyes! Does that hurt? By the way, I love to iron. It’s so nice to iron out life’s little wrinkles and keep a perfectly organized linen closet. On the other hand, dishes I despise. Constant turn-over, it’s never ending. It still looks perfect, Bruce! Nary a chip to the finish. I can’t imagine it’ll last any less than a couple of decades…if not quite a bit longer.